Punjab Govt. writes to Centre for permission since the Motor Vehicles Act, 1988, classifies only trucks in the ‘goods carriage’ category. Ahead of paddy harvesting season, the Punjab govt., which has already disbanded truck unions in the state, now wants to transport foodgrains from mandies to depots in low-cost “tractor trailers”, and not in trucks, while citing higher rates being charged by truckers. However, under the current Motor Vehicles Act, 1988, only trucks are classified as transport vehicles under “goods carriage” category. Accordingly, the Punjab government has written to the Department of Food and Public distribution, Ministry of Consumer Affairs, Government of India, seeking its permission for use of tractor trailers to transport foodgrains. The Consumer Affairs Ministry has further sent the communication to Union Ministry of Road, Transport and Highways, which called meetings on the matter. Sources in Transport and Highway Ministry said though a few meetings were held on the issue, a final decision was yet to be taken as tractor trailers were not considered safe for carrying heavy load while plying on highways and main routes. “These trailers are attached with a hook to the small tractor and have no extra brake system in the wheels, which is highly unsafe. When these overloaded trailers ply on slopes on the road and flyovers, they may go out of control because of imbalance,” said a senior official in the Transport Ministry, adding it would be quite prone to accidents. Happy Sandhu, the former president of now dissolved Punjab Truck Union, said the state needed 20,000 to 25,000 more trucks to ferry goods, particularly grain, and these tractor trolleys could not be a replacement for trucks. “We do not know who is the advisor of this government,” he said, wondering what will happen to roads when over one lakh trolleys from the villages of Punjab come out and start plying of national and state highways during the procurement season. Talking of high transportation charges, Sandhu said the government was earning much more from trucks by charging heavy taxes. 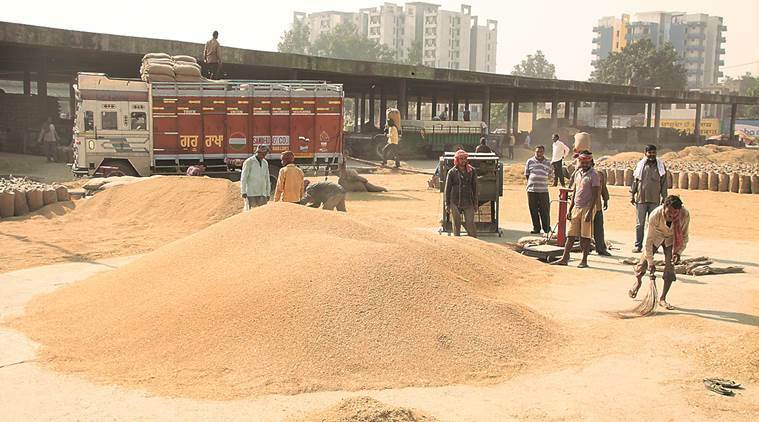 In Punjab, which is called the granary of the country, around one lakh trucks, including 93,000-odd trucks of the recently dissolved truck union, have been plying to transport over 250 lakh metric tonnes of grain (wheat and paddy) from mandies to depots/other states every year. For ferrying such huge amount of the grains, government agencies pay a total of around Rs 530 crore during paddy and wheat seasons annually as truck transportation charges. Punjab truckers are planning to operate in other states. After the ban on overloading of trucks in Haryana, Delhi and Uttar Pradesh by respective governments of these states, demand of trucks there has increased manifold because a truck is not allowed to carry more than 16 tonnes of load now, against 50-60 tonnes earlier. “We are getting calls from transporters in these states, asking us to operate our trucks there since local trucks are not able to meet the demand for goods transportation,” Sandhu said. Sandhu, who has been touring these three states to get some contracts for truckers from Punjab, said even the charges there were quite satisfactory as compared to Punjab. According to a minister in Punjab, the state faces glut-like situation in its grain markets during procurement season every year and faces transportation problem despite having one lakh trucks. If some of these trucks shift to other states, Punjab may face trouble in the procurement season, the minister said.